While these cards provide access to guests in their rooms and improve the security arrangements, they are also one of the most prominent marketing tools, crucial for the hospitality sector. 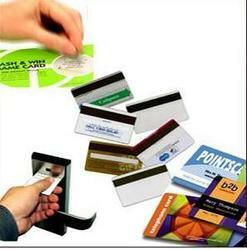 The company has come up as a major Manufacturer, Exporter and Supplier of Hotel Key Cards in Delhi. With the use of highly graded raw material and advanced techniques, we produce a fine quality of these Key Cards. We not only configure them as per the roomsâï¿½ï¿½ locks in your hotels but also print them with your name and logo to increase the brand value. This quality of manufacturing is complemented by our efficiency in supplying. We maintain bulk inventories of Hotel Key Cards, so you can place any size of order, even on short notices. We make sure that the consignments are safely delivered to you, within the decided time limits. Moreover, as compared to other Hotel Key Cards Manufacturers, we are offering them at nominal rates.